Migrating to the cloud seems to be top‑of‑mind for almost everyone these days. Even if you’re not actively involved in a cloud migration or “cloudification” of existing infrastructure – either because you’re not quite ready, you have legacy and monolithic applications that don’t lend themselves to a more distributed and agile architecture, or there are business and technology reasons to stay on‑premises – you’re still probably talking about it. If moving to the cloud is a even remotely a topic of conversation around your IT watercooler, then breaking ties to legacy hardware appliances is right there with it, hand‑in‑hand. Application delivery controllers (ADCs) are often explicitly associated with hardware. The term brings to mind large appliances, some of which take up 16U (almost 2 feet) of vertical rack space – massive, front‑door behemoths that can manage 100% of the traffic entering the data center. The name itself is rooted in the concept of a traffic cop acting as the one master controller of all traffic. Thankfully, not all ADCs are built alike or tied to proprietary hardware. Most use cases don’t really call for such massive, future‑proofed hardware, and software‑based ADCs make more sense where agility is key. Even if enterprises are not moving their infrastructure to the cloud, they’re increasingly adopting more flexible and agile development and deployment methods, and are finding that NGINX Plus provides the features and performance they need for highly available application delivery, while drastically reducing CapEx, OpEx, and even data‑center footprint. If you are moving to the cloud, a big point in favor of software‑based ADCs like NGINX Plus is that they can move to the cloud along with your application stack and stay as close to the app as possible. Your cloud vendor is not going to let you move your hardware appliance into its data center, so you’re locked into an on‑premises infrastructure as long as you’re using a hardware ADC. The question we get most often from customers replacing legacy hardware ADCs like F5 BIG‑IP or Citrix NetScaler with NGINX Plus is “How do I migrate my complicated ADC configuration to NGINX Plus?” The good news is that it’s extremely easy to translate proprietary ADC rule sets to the NGINX Plus’ content‑routing configuration language, which is much like the familiar syntax for Linux configuration files. The even better news is that once you’ve migrated the base configuration, you often don’t need to migrate F5 or Citrix’s complicated traffic‑management rule sets at all. Because NGINX Plus is a purpose‑built reverse proxy and content delivery platform, its configuration syntax is streamlined to represent content‑routing rules as simply as possible, making it possible to collapse or completely remove complicated F5 and Citrix rules. We have created two migration guides to walk you through converting your application load‑balancer configuration from F5 BIG‑IP or Citrix NetScaler to NGINX Plus. These guides provide sample configurations in F5’s TMOS control language or Citrix’s NetScaler configuration language, mapping them to the equivalent NGINX Plus configuration syntax. While a working knowledge of F5 or Citrix is beneficial, you don’t need much background or experience with NGINX Plus because the configuration syntax is familiar from Linux. And if you need help migrating more complicated F5 BIG‑IP iRules or Citrix NetScaler configuration policies, check out Migrating Layer 7 Logic from F5 iRules and Citrix Policies to NGINX and NGINX Plus on our blog. Hardware will always have a place in on‑premises infrastructure, and hardware‑ and software‑based solutions can coexist under the same rack. 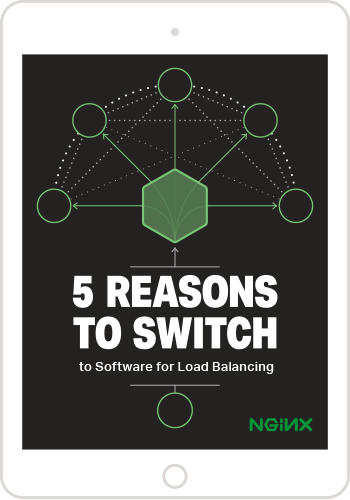 But many NGINX Plus customers have been able to move completely away from hardware, eliminating large CapEx expenditure up front and OpEx support costs in the long term. Migrating from F5 BIG‑IP and Citrix NetScaler hardware appliances to the NGINX Plus software ADC is probably easier than you think, so take a look at how NGINX Plus can simplify your life while giving you more flexibility and options in, and around, the cloud. Get acquainted with NGINX Plus today: start your free 30-day trial or contact us for a demo.